$100 American Express Gift Card Rebate when you purchase your EMV equipment from us by April 30, 2015!!! What Is EMV? EMV stands for Europay, MasterCard and Visa. EMV technology is currently the global standard for payment processing with credit cards and debit cards. The United States is one of the last countries to migrate to EMV. EMV cards, sometimes known as "chip" cards, are an advanced-security credit card designed to reduce fraud by utilizing advanced technologies to prevent counterfeiting, skimming card data, and other types of fraud. EMV cards use encryption and can support tokenization at the time of purchase and require contact with a point-of-sale terminal or close proximity to a contactless payment reader during card-present transactions. Merchants can prepare for the October 2015 EMV mandate by upgrading current payment terminals and point-of-sale equipment to an EMV-capable model. Processing companies are already preparing for the EMV mandate and many offer a range of EMV-capable terminals. Merchants will need to work with their processor to ensure that they have an EMV-capable terminal prior to October 2015 in order to reduce their liability for fraudulent transactions. MerchantsXL, LLC provides machines to their clients at wholesale cost. All of our EMV machines are brand new and can be setup to accept transactions through a dedicated phone line or Ethernet connection. 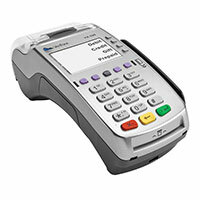 We also have programs where we can place a new EMV machine in your business at no cost. MerchantsXL stands firm that we do not lease machines as we believe that the practice is 100% unethical and ends up costing business owners as much as 10 times the actual cost of the machine. Note that not all consumers will have EMV chip cards in October 2015. Due to the expense of card issuance, EMV chip cards will be rolled out to consumers in stages. Some consumers are already utilizing EMV chip cards, while others may not for many months still. As of March 2015, EMV chip cards are already being issued by American Express, Citibank, Wells Fargo, Bank of America, JPMorgan Chase, and U.S. Bank. Some credit unions are also already issuing EMV cards. If you have not received an EMV chip card from your issuing bank, you can call to request one from them to escalate the process. EMV-capable point-of-sale terminals currently available still provide the option to accept traditional magnetic stripe credit cards, allowing merchants to process both card types. On October 1, 2015, in order to reduce card fraud, the associations (i.e. Visa, American Express, MasterCard and Discover, etc.) have authorized a liability shift that will be implemented and enforced for all merchants with the support of the Federal Government. This means that whichever party prevents a contact chip transaction from occurring will be financially liable for any resulting card-present counterfeit fraud loss. Therefore, if a merchant does not have equipment that can support EMV-chip technology and this is the cause of the fraud, that merchant will be financially liable. Merchants who comply with the EMV mandate and utilize EMV-capable terminals will not be subject to the liability shift; liability will remain with the processor. EMV cards have a special "chip" embedded directly in the card that communicates with the point-of-sale device when a customer uses the card and authenticates the transaction. Many EMV cards also utilize a PIN, adding another level of security. The chip encrypts transaction and card data differently every time the card is used, making it very difficult for data to be stolen and used for fraudulent purchases. Currently, EMV cards include a magnetic stripe, allowing the chip card to be used as a traditional card if necessary. EMV cards will continue to be issued with a magnetic strip in the United States as we go through the EMV adoption process. Countries that have implemented EMV payment acceptance have consistently experienced reduced card-present fraudulent activity. Additionally, unlike traditional cards, stolen credit card numbers can't be used by thieves to make new counterfeit cards. With encryption and tokenization, EMV card data can't be "skimmed" (illegally copied) at the time of use, preventing theft of card information that would be used for unauthorized purchases. The majority of the globe has already adopted EMV payment acceptance with great success and now the United States is following suit in order to further prevent fraudulent activity. It's important to note that while EMV cards are successful at reducing fraud in card-present point-of-sale situations, the technology can increase fraud in card-not-present situations if additional security measures aren't put into place. For this reason, it is imperative to take advantage of security features in card-not-present environments, such as online purchases. Necessary security features for such transactions include tokenization and end-to-end payment encryption. Merchants can also take advantage of existing fraud prevention tools such as Address Verification Services (AVS) and Card Verification Value (CVV), and 3D Secure fraud tools offered by the credit card companies, such as Verified by Visa and MasterCard SecureCode. In addition to added security and reduced fraud, merchants may be eligible for other benefits by upgrading to EMV-enabled terminals. Merchants that utilize terminals that can accept both contact and contactless payments may receive partial or complete PCI compliance fee relief from Visa and MasterCard. Requirements vary, but merchants need to show that they process a large percentage of their daily transactions through a terminal that accepts both contact and contactless payments.